A good sharpening stone or whetstone is an essential tool for any cook, whether they are a professional or just a hobbyist. As the name implies, sharpening stones are small tools that you can use to keep your knives sharp and precise for chopping and slicing. There are many different types of whetstones on the market, which can make choosing the best one very overwhelming. Here’s your guide to choosing the best sharpening stone for your cooking activities. 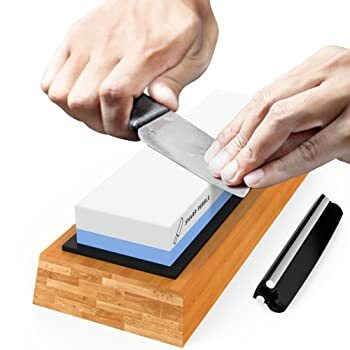 Although there are many choices out there for the best sharpening stone, here are some that are high quality and easily accessible for most people. This tool actually combines three different sharpening stones into one, so you can sharpen all of your knives with one tool. The stones are mounted in a system that rotates with a crank, so you can transition from one to the next very quickly and easily. It comes with a built-in cleaning solution that maintains the stones, and the system catches it during use to help keep things clean and organized. However, overall this stone system is quite affordable and perfect for the minimalist cook who likes multi-use tools. 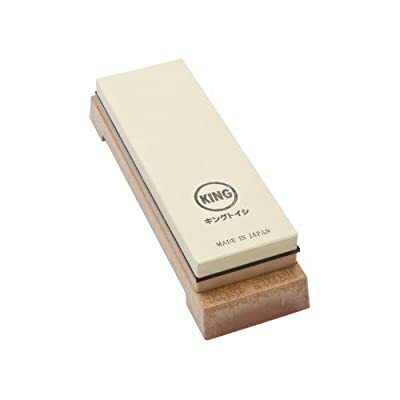 This Japanese-made sharpening stone comes with two grits - 1000 for medium to coarse sharpening, as well as 6000 for fine finishing. It also comes with a base to help keep your stone steady during use. The stone is made from a ceramic blend and mimics the results you would get with a natural stone. This stone does require some maintenance, which may be a turnoff to those who like to sharpen quickly. The coarser side needs to be soaked for a few minutes before use, while the fine grit side just needs a splash of water. These stones are often praised for their durability - they are very convenient and effective for knife maintenance over a longer period of time. This set comes with an 800 grit and 1300 grit sharpener, as well as many tools for easy sharpening. These grit levels are ideal for those who need frequent knife maintenance, but no detailed finishing. The set comes with two base options - one that is flat and one that is at a 15 degree angle. This is ideal for helping beginners master knife sharpening techniques. The set also includes a unique cleaning stone, which you can use to keep the stones pure after use. The brand is also known for good customer service. They offer a two-month money back guarantee on this product, which allows you to try it first to make sure it works for you. It also comes with a detailed instruction guide as well as access to online video tutorials to help you learn the basics of knife sharpening. Because of this, it is a great tool for beginners to invest in. 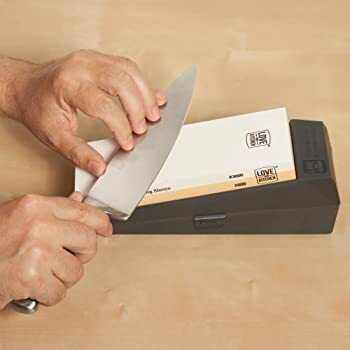 This double sided set includes both 1000 and 6000 grit sharpeners, which works well for both amateur and professional cooks or knife enthusiasts. One of the best features about this sharpener is that it comes with a very sturdy and durable bamboo base to keep both the stone and your knife steady as you sharpen. This stone is very easy to use and is a great buy for anyone looking to sharpen their knives. It comes with detailed instruction manuals as well as a knife sharpening angle guide for anyone that is just learning how to sharpen their knives. This diamond sharpener is ideal for someone that wants to sharpen their knives very quickly and efficiently. This one is on the coarser side, so it is best for someone that does not need a fine, detailed grit for sharpening. 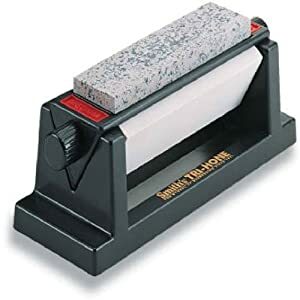 Diamonds are very strong and durable, so this sharpener can last for many years to come. We recommend this sharpener to those who want to sharpen quickly without too much effort. 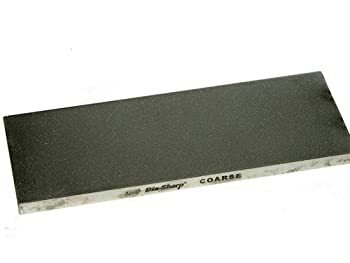 The downside to this sharpening stone is that it does not come with a base - that will need to be purchased separately in order to ensure safety. This stone is best for those looking for speed and versatility when it comes to knife sharpening, and don’t need additional tools or instructions to help with the sharpening process. When choosing a sharpening stone, there are a few different factors that you must consider in order to find the best one. We find that taking these options into consideration helps you find the best stones for your needs. Like sandpaper or other filing tools, whetstones come in grit sizes. However, the grit system for sharpening stones is different than that of sandpaper. Most chefs will need two or more stones of different grit sizes depending on what knives they need to sharpen. When making a purchase, you will need to think about the type of knives you are sharpening and whether a coarse stone will be enough, or whether you'll need something more fine. This is the size of the area around the sharpener, and it needs to be fairly large in order to keep the knife stable while you are sharpening it. If the deck is too small or irregularly shaped, then you won’t be able to properly sharpen the knife due to a lack of balance. Ideally, you want to spend as little time as possible prepping or maintaining your stones, particularly if you are just learning how to sharpen a knife. Some whetstones require frequent cleaning or flattening, which can be very frustrating. When choosing a sharpening stone, it is often helpful to go into a cookware store and consult with experts. Chef's Armoury notes that a high quality stone can last as much as ten times longer than an inexpensive stone. However, not all expensive sharpening stones are created equal - many brands just stamp a notable name on a cheaper quality stone. It is important to thoroughly research the brand before making an investment. There are many different types of sharpening stones on the market. There is no one right choice for a sharpening stone, as each has their own benefits. We have recommended stones of all types, but it is important to make sure that the stones offer superior performance. While there are a huge variety of stone types, here are the main ones. These were the first types of sharpening stones and originated in Japan. They are not very common anymore, but are extremely high quality and have random grit sizes that allow the edge of the blade to stay sharp for a longer period of time. These are a very common type of stone. They can easily be found in many hardware stores, and tend to be on the coarser side. They do work well, but are somewhat slow to use. Although these haven’t been around for very long, they are becoming quite popular. They can sharpen a knife very fast, which is very appealing to many cooks. However, they are very sharp and can scratch your blade if used without care. These work somewhat similarly to natural stones. However, they tend to vary widely in quality depending on the manufacturer. They also need a lot of maintenance, which is not ideal for many chefs. They are quite effective when used with the right knives. These are modern stones that are designed to replicate natural stones. They come in a variety of different grit sizes and differ depending on the brand and model. They are very effective and are usually the easiest way to maintain your knives. Overall, there are many great sharpening options on the market. We like the Smith TRI-6 Sharpening ﻿System because it provides the most options for knife sharpening, but any of these options will work well for keeping your blades sharp.